Heat a charcoal or gas grill to medium-high heat. 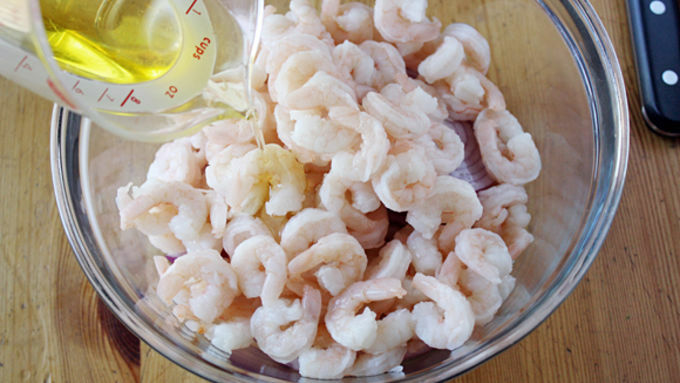 In a large bowl, toss shrimp and onions with olive oil and salt and pepper. Place shrimp on skewers. 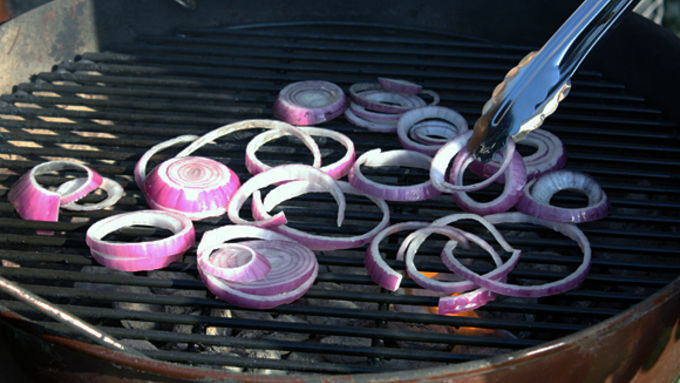 Place shrimp and onions on grill and cook until charred, about 5 minutes. Remove from grill, remove shrimp from skewers and set aside. Reduce grill heat to medium. 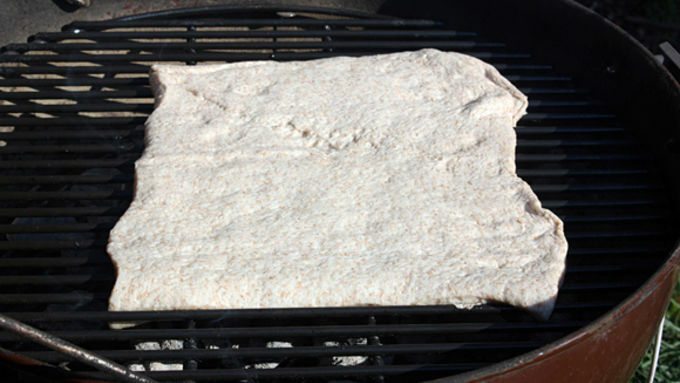 Brush grill top with olive oil (or spray with cooking spray) and place pizza crust in center of grill. Cook until bubbles begin to form on top, about 2-3 minutes. Using tongs, flip crust and brush top of crust with olive oil. 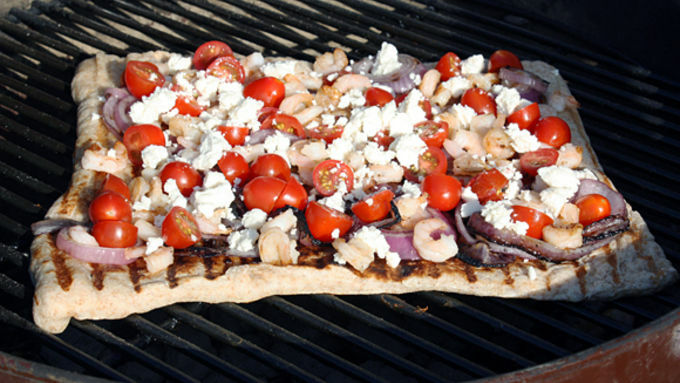 Quickly place shrimp and onions on top of pizza, then add tomatoes and cheese. Cook until crust is cooked through, about 3-5 minutes. Carefully remove pizza with tongs and/or spatulas and place on baking sheet/cutting board. Sprinkle with chopped cilantro. Cool a few minutes before slicing. If you need more awesome in your life, I’m here to help. See, it all starts with a grill. 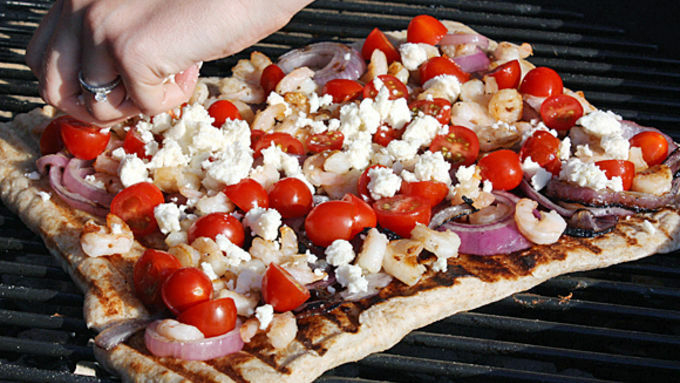 Add the new DELISH Pillsbury Artisan Pizza Crust, some shrimp, some veggies and cheese, and dudes (and dudettes) – you’ve got yourselves a seriously awesome Grilled Shrimp Pizza. I’ve been a big fan of grilled pizza for some time now. The slight char added to the crust is just tasty, just crunchy, just flavorful enough to elevate this regular ol’ shrimp pizza to AWESOME level. Plus, the shrimp and onions on top also are grilled, so it’s double grilled and therefore doubly awesome. You get the idea. First, be sure you have all of your ingredients chopped, sliced, measured and ready to roll. The pizza grills quite quickly so you won’t have any free time to perfect your chopping skills between steps. 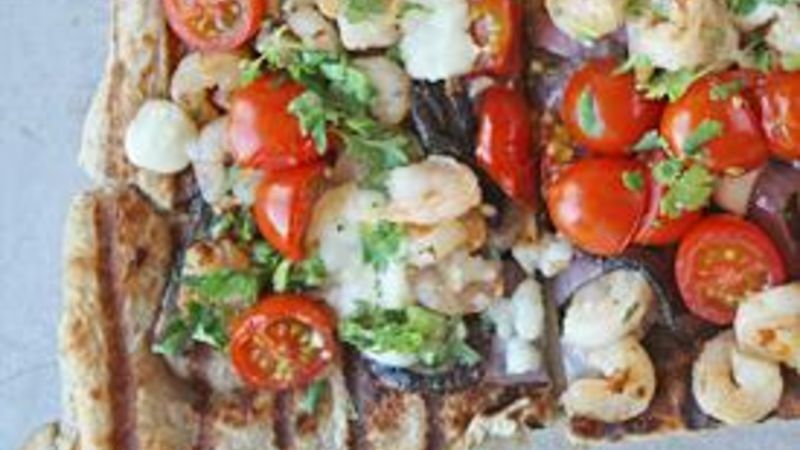 Top that purdy pizza with chopped fresh cilantro, and serve! More awesome in your life in about a half hour… oh, and dinner, too.